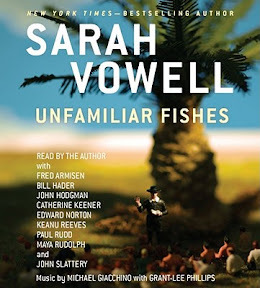 Unfamiliar Fishes [Audiobook Review] – my books. my life. I have been meaning to read Sarah Vowell for a long time. I have had my good friend Lisa’s copy of The Partly Cloudy Patriot for AGES. So when I had the opportunity to listen to her newest book, Unfamiliar Fishes, I took it. Unfamiliar Fishes is the history of Hawaii from the time the missionaries arrived in the early 1800s through annexation. From plate lunches to infertile monarchs, Vowell covers it all. And makes you laugh throughout. My conclusion is that Vowell is a very good narrative nonfiction storyteller. And while I really had no interest in Hawaii’s history, she made me interested. But I struggled with the audio. I think it is partly my fault. I wasn’t really in an audiobook mood when I started. And then I must have listened to it on shuffle for awhile because things kept repeating. And I was distracted by the many characters narrated by many people and the music (I still heart you Grant Lee Phillips) and I honestly didn’t think that Vowell was the best narrator for the story. Sure, she captures her dry tone and sarcasm perfectly (since she wrote it) but her voice was hard to listen to for long periods. I recommend the book but I recommend reading this one in print. I really really love this woman, but her voice does require some getting used to. I’ve listened to everything she has done except for Partly Cloudy Patriot (why the libarary fails to carry that one I don’t understand) and I wouldn’t say that Fishes is the best. I think my fav is Assassination Vacation. I read this one in print, and I can’t imagine having had listened to it on audio. It was very dense, and there was a lot of information there, which usually translates to a slog for me if done in audio. But I did really enjoy the book. The subject was one that I didn’t really know a lot about, and some of the information that she shared was very eye-opening. I loved the bit about the bellybuttons and mentioned that in my review. I also shared that around the dinner table and got some very weird looks! Her voice is what did me in too. I loved the book – just not the audio. I do want to read some of her other books because I was fascinated with how she brought all of her research together. Great review! That’s so interesting, because Sarah Vowell is one of the people I will only listen to in audio – David Sedaris is another. Though, admittedly, I do love her voice. In any case, that’s the reason I haven’t read this yet – I haven’t had good audiobook time.